I got to thinking about the issues of race regarding the recent tragic police shootings, both the shootings of police and the shootings by police. 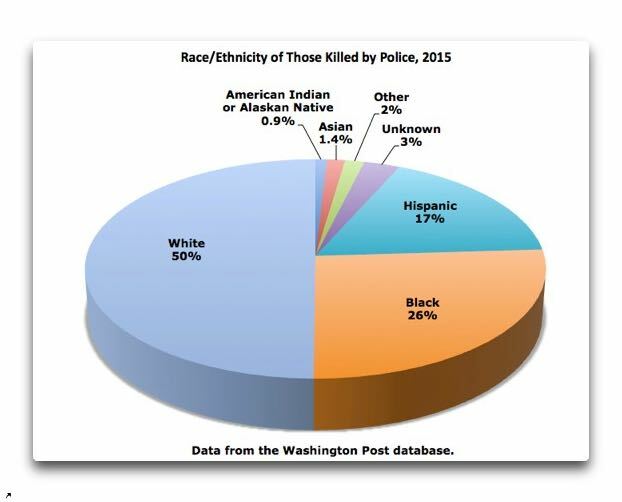 The best data is from the Washington Post, which has a detailed site listing all of the people killed by police, which begins in 2015 and goes to the present. I thought I’d analyze their data. I looked at the data for the year 2015 because the full 2016 data is not in yet, and also in order to be able to compare it to other annual datasets. 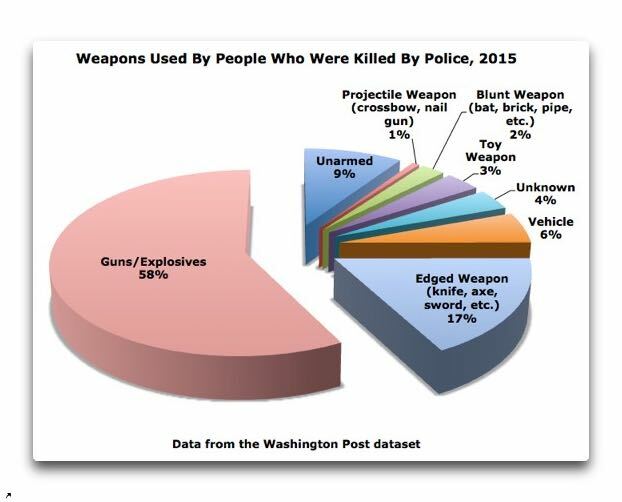 Regarding the civilians killed by police, more than nine-tenths of them were armed at the time—58% of the people killed had a gun or explosives, 17% wielded a knife or edged weapon, 9% were unarmed, 6% used a vehicle, and tragically, 3% had a toy weapon. The rest used mostly clubs, hatchets, hammers, baseball bats, the usual assortment of your basic stone age deadly weapons that can kill you just as dead now as they could in 1500 BC. By race and ethnicity, there were 494 whites, 258 blacks, 172 Hispanics, 15 Asians, 14 American Indians or Alaskan natives, 9 “other” races, and 28 deaths with the race not specified. Which leads to the question … is there a racial imbalance? 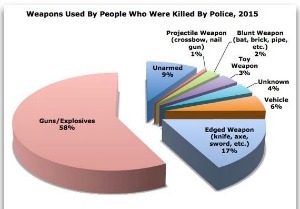 And in particular, are African-American people being killed at an excessive rate? Of course not. Instead, it simply demonstrates that men both commit and are arrested for far more crimes of violence than women; that men are far more likely than women to both carry and use weapons; that men are far more likely to both threaten and commit serious violence against a police officer than are women; and most importantly, that men are far more likely than women to violently resist arrest.